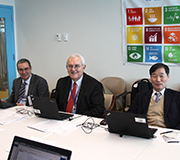 People from across the globe tuned in for the live Facebook chat on 15 March on global governance and the 2030 Agenda for Sustainable Development, keeping the three panellists from the Committee for Development Policy (CDP), Prof. José Antonio Alonso, Prof. José Antonio Ocampo and Prof. Keun Lee, busy with questions on democracy, corruption, climate change, labour, education and financing for development. 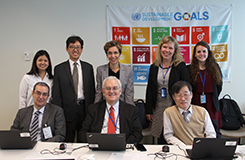 The Facebook chat, a side event to the CDP’s 18th plenary session, offered an opportunity to discuss and share the findings and recommendations of the new publication “Global Governance and Rules for the Post-2015 Era,” co-authored by CDP members, including the three panellists, and other contributors. The 2030 Agenda represents a great opportunity as well as a challenge for the international community. In order to respond to this challenge, global governance have to be rethought and reconsidered, to achieve the new development targets, end all forms of poverty and leave no one behind. “It was very interesting because we could answer some interesting questions about the situation and the global agenda,” said Professor José Antonio Alonso. During the one hour chat, the online community shared questions on a wide range of issues with a special focus on developing and least developed countries, reflecting on the current emerging issues addressed by the sustainable development goals of the 2030 Agenda. “The broadest participation is always good for any policy debate,” commented Professor José Antonio Ocampo. “The most equitable systems are those in which independent producers have enough resources and knowledge to produce agricultural goods,” they wrote in response to a question about promoting agriculture in developing countries. “We are facing so many problems globally, please keep making noise and spread the word, it will help to find solutions,” concluded Prof. Keun Lee as the event wrapped up. The panellists promised to continue to communicate with the online community on their research on the sustainable development goals (SDGs).